There are approximately 10,000 people in Europe that posses a dan grade, and a total kendo population of approximately 20,000. The population of kendo is small compared to Japan, and the number of children is inevitably very small. 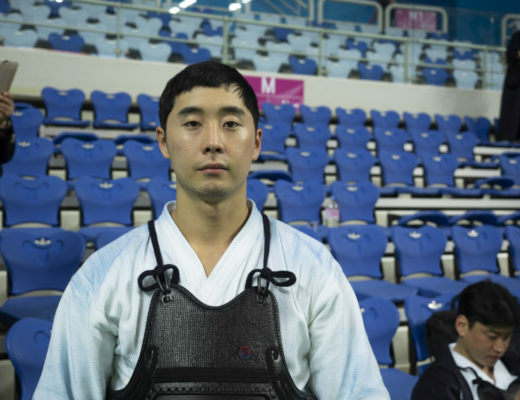 The number of training days and the number of tournaments are also limited. In both Japan and overseas in a lot of cases children who start kendo do so inspired by their parents. However, it can be painful, challenging and the repetitive nature of basic training can make it hard for children to stay interested. 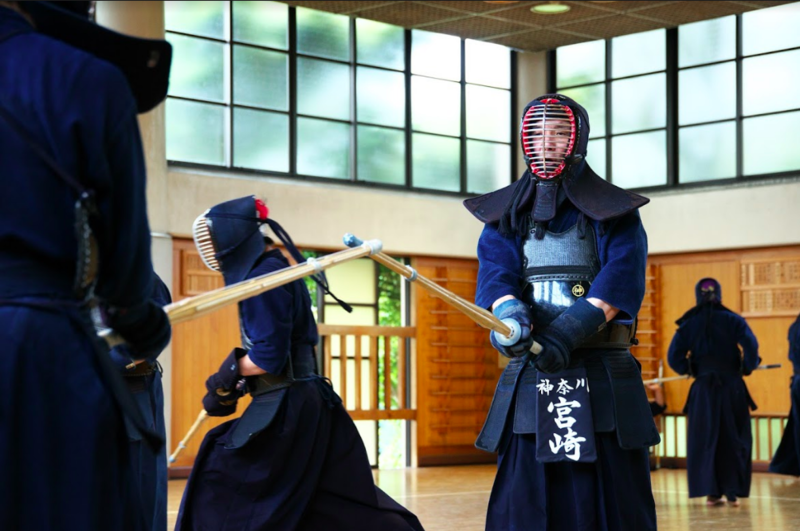 Outside of Japan, it is even more difficult to keep children interested in continuing kendo. Under such circumstances, Wakakoma Kenshikai in Belgium is home to 40 boys and girls, and these children have fun and do their best in keiko. Young national squad members who participate in the WKC can be seen taking care of the children. It is a very warm dojo. Mr. Yoshinobu Kurogi is at the center of this dojo. He was transferred to Europe in 1990, and founded Renshinjuku Dojo in the Netherlands. He loves children and it is striking to see how he talks with them on the same level. 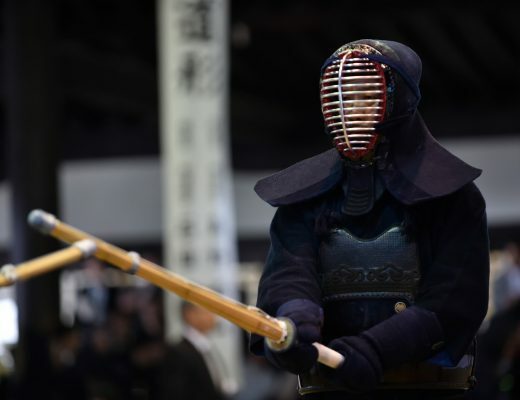 In this article, we’ve asked about what Kurogi sensei cherishes in teaching boys and girls in Europe, and ideas for getting keeping them interested and continue kendo. Kurogi Yoshinobu, kendo renshi 7th dan, working at Fuji Travel, founder of Wakagoma Kenshikai in Belgium and Renshinjuku in the Netherlands. Born in 1963. Came to Europe in 1990 for his work. After ten years of kendo hiatus, he resumes kendo at the Museido dojo in Amstelveen. At the time there was no kendo education for children in the Netherlands. He got invited by a local Dutch kendo practitioner to start a dojo for expat’s children, and together they founded Renshinjuku dojo in Amstelveen. After moving to Belgium, he established Wakakoma Kenshikai in 2004 and is engaged in the guidance of kendo for children. 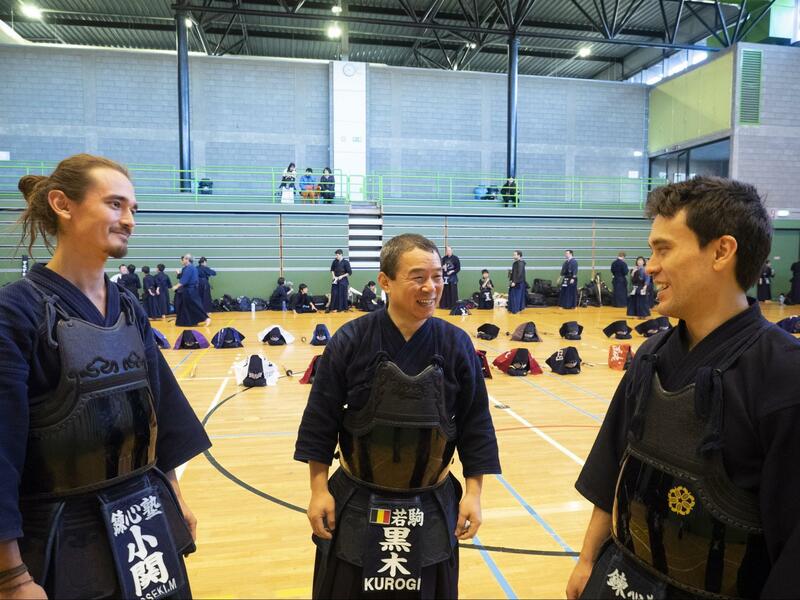 Every January, a two-day joint keiko is organized by the Wakakoma Kenshikai in Brussels, Belgium. Boys, girls and adults from Belgium, Germany, the Netherlands, England, etc. gather to deepen relations and polish their skills. This year’s event in 2019 is the 10th anniversary. Belgium, Germany, and the Netherlands have been organising competitions for boys and girls, led by three countries, and have been running them for 25 years. Not only do they organise these competitions, but at the start of every year this joint practice is organised to have the children of all participating countries deepen their friendships. Kurogi sensei is fond of children and this gives him the energy to put so much effort into educating and organising events to make European children stronger. 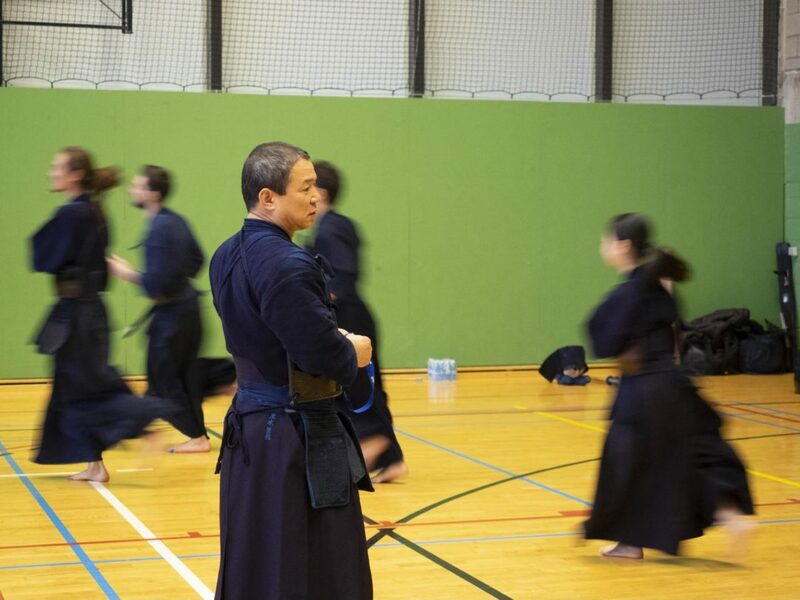 When Kurogi sensei was transferred to the Netherlands, he not only enjoyed kendo for the first time in 10 years, but he was also indebted to the general support in his life from Dutch kendo friends. With one of those associates, Mr. Bert Heeren, he established Renshinjuku in the city of Amstelveen. To this day it has many Japanese members, and it was started as a children-centered kendo dojo. The original reason for founding Renshinjuku is that he wanted to help teaching children as a way of returning a favor to Bert Heeren. The basis of his teaching was taught to him as a boy in his hometown of Miyazaki. He felt that he would like to pass on the lessons he received from his teacher in Miyazaki to Dutch children. It is essential but difficult to secure time for teaching. If you work and have a family, you can not continue teaching if your heart is not into it. However, because he likes children he has been teaching for a few decades already. Currently, Kurogi sensei has moved to Belgium and is teaching at Wakakoma Kenshikai. The Wakakoma Kenshikai is home to a thriving community. Children are practicing kendo and polishing their ability. At the joint reunification, held on January 19th and 20th too, the children’s lively vibe was impressive. 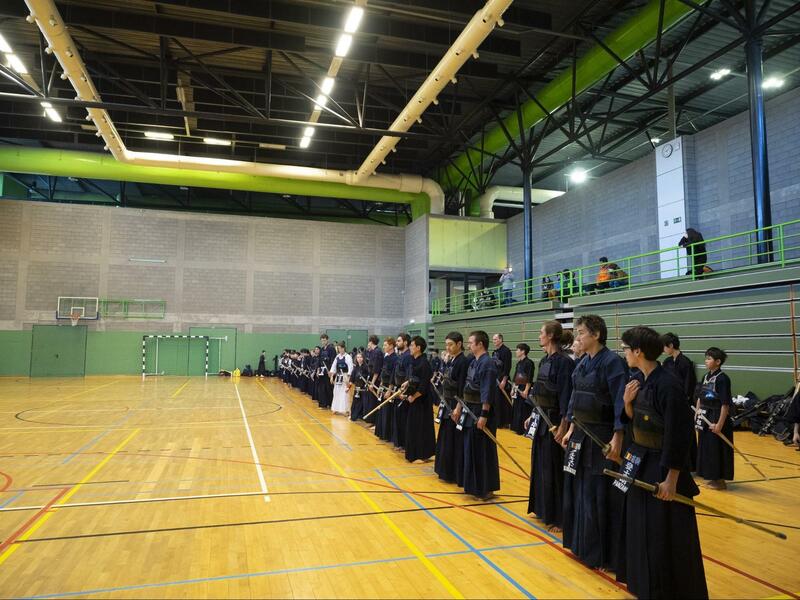 In Europe, kendo still has a minor scene and it is difficult to gather people. In some cases even if there are new members to the dojo, motivation might suffer if there aren’t many friends of the same age. Even though this is quite common in Europe, people gather around Kurogi sensei and a lively community is created. Such an atmosphere can not be made easily. In managing the Dojo, we’ve asked about what Kurogi Sensei is concerned about and what he values. Indeed, when you look at the exchange between Kurogi sensei and the children, the children smile as they answer questions such as “How was your lesson today? Have you enjoyed it? Have you become strong?” In addition, the communication with parents is smooth. They actively share what they saw and felt in the practice of the day. Greeting is the foundation of human relationships. The children of Wakakoma Kenshikai certainly have good greeting manners. The children are in good relationship with each other. The nationalities of the children who belong to Wakakoma Kenshikai vary. There are Japanese children, Belgian and mixed children. However, everyone is included and playing together. “Children will play together even if they don’t understand each other’s language. Unlike Japan, Belgian children are not all in the same school even though they live in in the same district. There are various schools such as local schools, supplementary schools, international schools etc. The children spend their time in various environments. There are many fun things to do besides kendo. When Mr. Kurogi was transferred to the Netherlands, these two were still elementary school children. Their relations continue even as an adults. We’ve asked Kurogi sensei what he pays attention to in keiko. It appears that he focuses on having the children experience a sense of accomplishment by letting them surpass what they feel like is their physical limit. In other words, having them do things they thought they could not do, thus giving them a feeling of accomplishment. Belgium has few tournaments for children, and regular practice does not always lead to results of the competition. If we focus on winning and losing, it will become harder for the children to continue. As a teacher, he would like them to win competitions, but not so much that the keiko focuses on winning. Furthermore, children won’t develop unless you praise them once in a while. For example, it can be important to acknowledge that they did their best after keiko or have them perform techniques as an example when they are good at it. One of the differences between children’s kendo in Europe and Japan is the vacation season. In Europe, school facilities such as gymnasiums can not be used during summer vacation. Because of this children do not practice kendo in summer and enjoy their vacation. “Belgium also does not practice during the summer for about a month. I think it’s good to get them sharp again. It may not be in line with the purpose of kendo training but I feel a little sorry to ask the children to do keiko at their age in holiday season. When you are a child, it is important to play and rest well. If they really want to get into it, they can do it with their own will at a later stage in their lives. One of the reasons for Kurogi sensei to teach Kendo with enthusiasm is to return the favor to the European kendo world.